Unfortunately I have neighbors that leave a dilapidated tool shed and other debris in their back yard. I believe that the rats that are invading my yard originate there. Hence, I need a slow acting bait that the rats will take back to the nest to get rid of the rats at the source. 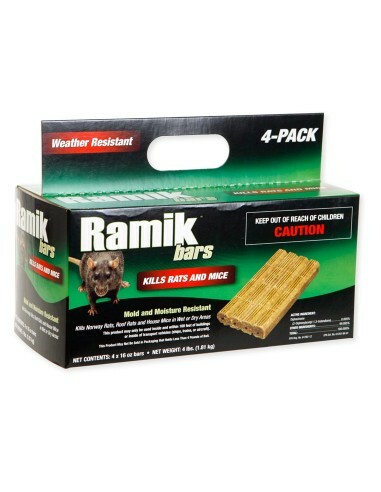 I bought the Ramik Bars to try to solve the rat problem. 1) Is this what you would recommend? 2) Rats appear to be close cousins to squirrels. I like squirrels and do not like rats. Both are smart and are +/- similar sized. I believe that the squirrels are also getting to some of the 1" sections of the Ramik Bars. Will squirrels eat the Ramik Bars? And will it injure/kill the squirrels? Hi Curtis. Ramik is a slow acting poison that kills rats and mice. Generally squirrels won't eat it. That the good news. Squirrels typically eat nuts, like peanuts, acorns, etc. If they are eating the Ramik, it could kill or injure them. If they are eating it, I would recommend to place Ramik inside of a tamper resistent rodent bait station. We have several available or you could just build a small box with holes in the side small enough for rats but too small for squirrels. Hope this helps! Normally squirrels won't feed on rat bait - especially blocks. I would just keep a watchful eye out and if you find any dead squirrels, change plans. There are not any baits available that are rat specific. These baits are essentially a toxicant mixed in a vegetable base with wax. Squirrels generally only eat whole nuts such as peanuts, acorns, etc. Thank-you Ron. I do feel a little better now. I do feed the squirrels and like to watch them play. What would you use or recommend for mice and rats in the yard and garden? Do squirrels eat purple hull peas? It's possible that squirrels can eat purple hull peas, but I can't be for certain. I have never heard that. I would suggest to get some and see if they eat them. Squirrels will eat unsalted in shell peanuts. Okay, thanks! Something is eating the peas in the pods. Whatever it is is eating a hole where the pea is and then eating the pea. It doesn't eat the entire pod, just the pea. It will normally eat several peas in this manner, sometimes eating all the peas but normally just eating a few.